Student Committees of EHL are now using Planify! Why Student Committees Love Planify: The EHL Case. The Ecole Hotelière de Lausanne, one of the most famous hospitality school in the world, offers its students a wide variety of activities that they can take part during their after-university life. These range from sports activities, academic committees to charity associations. Many of them organize numerous trips, social events and workshops throughout each semester. emails. This led to everyone receiving several notifications. As for the organisers, they had the boring task of responding to the same questions over and over again. Facebook is a great way of promoting an event. But not to have an overview of what’s happening during the entire semester, always in your pocket! After meeting several committees, we found out that Planify would be the ideal tool for them in terms of time and resource saving. Moreover, storing all information in one place (You can see our video with several EHL students here). 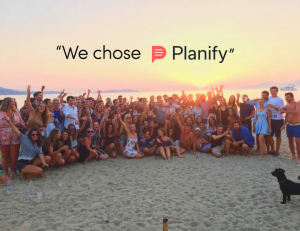 How Planify changed the way EHL student committees plan? Planify (download here) is used in aiding the students staying updated on all the current events in university that they can participate in, by simply checking the mobile app. The committees used it to organize ‘all year’ plans to keep the students interested. An emblematic use was the ‘Graduation trip 17’ that took place in Greece with around 130 students. Planify was their ideal companion for this group travel and an easy way for the organizers to share information about the events and activities taking place each day. With so many students on the trip, this was the easiest way to communicate unforeseen events and changes through notifications. A WhatsApp group could do the job? Are you serious about it? It can help, of course, but this way of group communication is, most of the time, a mess. Planify represented for Grad’ Trip 17 the ideal one-way communication assistant. Emergency contacts in a new country such as Ambulance, Police, Hotel information, reliable taxis and so on, was found to be immensely useful. The tips section allowed the organizers not to repeat themselves continuously, as the students had FAQ and answers right there in their pockets! In a new destination, always having the maps in their pocket, online as offline, was highly useful, especially since a lot of the time they did not have access to the internet. Documents section was filled with useful information from the tour guides and organizers on what to avoid and stay clear off on their trip. Slowly more and more committees started using Planify, hence trying to make Planify THE platform used by EHL to share after school activity information. When new members are interested in joining and request more information about the committee, they just need to access Planify’s mobile app to be able to see all past events and happenings. Planify was great for inter-committee communication on EHL, therefore saving time with emails. Organizers included the list of the entire committee with the titles and departments of each person, making it really easy for everyone to look up the exact person they need through the mobile app. Finally, the university organizes many events on a weekly basis, hence sometimes the information gets mixed up and changed, and therefore Planify was the perfect solution. It always has the most updated version inside the application. So far the students seem to be loving it, and they can now Plan Less and Enjoy More.